My kids love to read. I’m not exaggerating one bit. My daughter is 10 and she has read more books than I can count including a 14 book fantasy series where each book averages about 1000 pages. My son is 8 and he is on book 6 of a wizard series. People ask me how I did it all the time and I tell them I read to my kids. I started reading to them at a few months old and we we read many stories every day and we talked about the books together. Usually, people look at me like I am keeping my secrets to myself but I never knew how to describe in detail how to foster a love of reading in preschoolers until recently. This post is sponsored by The Tessy & Tab Reading Club but all opinions expressed are my own. Play letter games with your child to help them get interested in letters. Sit down with a good book at least daily and don’t rush it. Start a dialogue with your child. Ask questions and encourage your child to be detailed in describing what he or she sees. Talk to your child- the more you explain the greater their knowledge of how things work. Point at each word as you read. Follow up the story with fun activities around what you read. Don’t rush your child or pressure your child. Learning happens best when it is fun. Provide positive feedback for your child’s efforts. 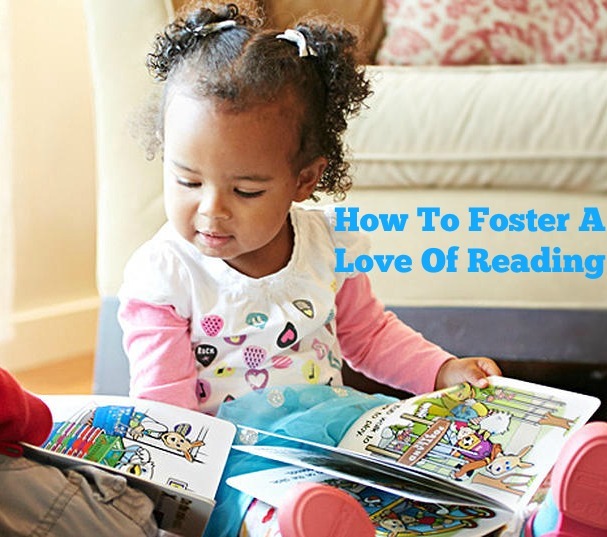 If you are still wondering exactly how to go about fostering a love of reading in preschoolers, then you will love the The Tessy & Tab Reading Club because they give you step by step instructions, provide all the materials, and make it super easy! Publisher and co-founder of The Tessy & Tab Reading Club, Judy MacDonald Johnston, says,”There is no ‘work’ for you or your child in our program. It’s all about play. 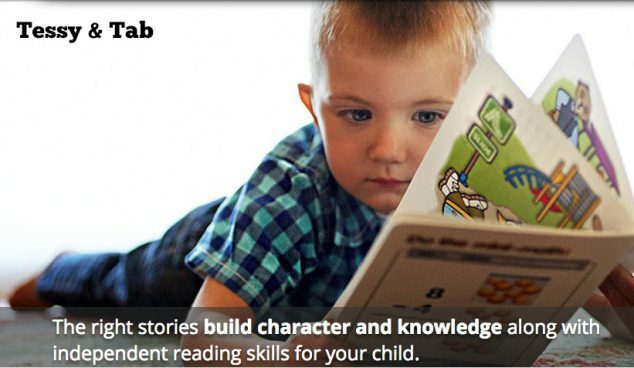 We engage your child’s natural curiosity and allow their intuition to take them to the next level.” The Tessy & Tab Reading Club is all about connecting reading to pleasure and fun time. If reading means conversations, stories and games in a supportive environment, then they will love reading! The Tessy & Tab Reading Club put all these tips together for you with with all the materials you need and extras to make it even more fun and easy. They bring you all the best practices in reading motivation and comprehension. They provide a way to create anticipation for each book. 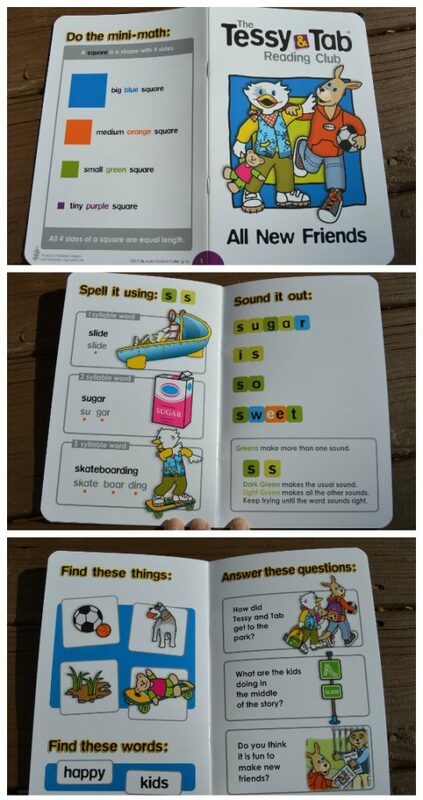 They also provide questions and activities for each book. 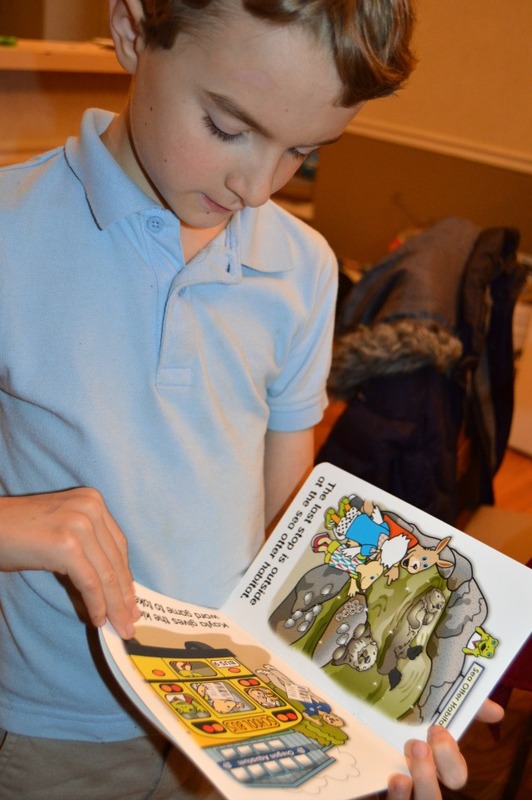 The books are designed to reveal new layers of what books and reading can offer as your child naturally gains understanding and moves forward. 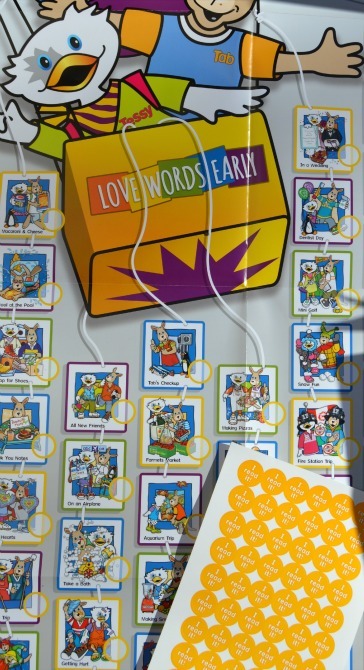 There are so many fun things included in this box that will get your child excited about reading! The system through which the reading club works is that you deliver one book a day to your child in the enclosed cloth envelope. It is a fun ritual and they like feeling like they are getting mail. There is also a poster with each book title so they use the “I read it” stickers to mark them off as they read the books. Imagine their pride (and yours) as the poster fills! Your child will look forward to book time as part of their daily routine. 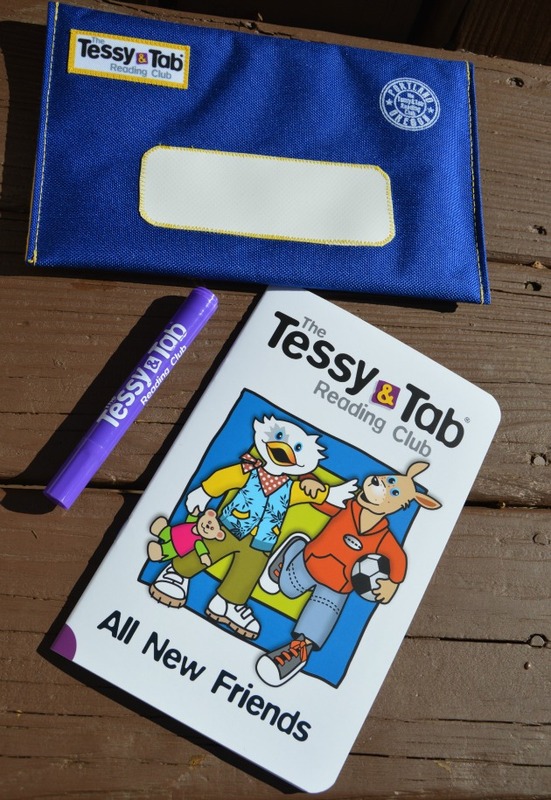 Tessy & Tab Book Club even offers fun suggestions on how to deliver their book envelope. Each book has fun illustrations, a great story, story questions, find it activities, sound it out activities, and mini-math activities. That is not all. 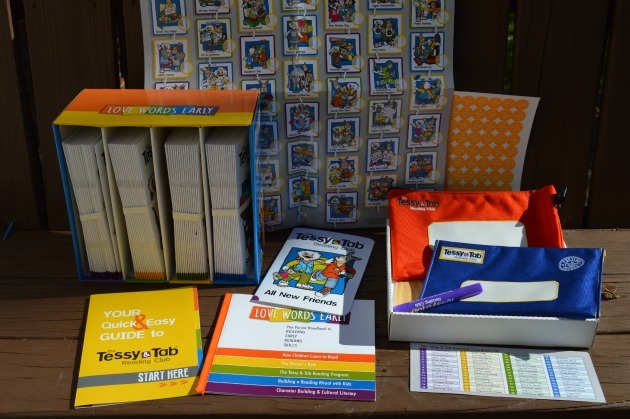 Tessy & Tab books are designed to share non-cognitive skills with your children too. Resilience, adaptablility, collaboration, curiosity, perserverance, caring, and self-control are all built into the story lines. The book character, Tessy & Tab, will sometimes lose a game, or find themselves in trouble. The narratives will help show your child that is OK and they can try again and do better next time. I genuinely think that the Tessy & Tab Book Club is such an amazing resource for every parent and it is sure to foster a love of reading in preschoolers. I can tell you first hand that once your kids love books, they will be off and running and learning new things every day. The love of reading is such a wonderful gift and an early investment in your child (or grandchild’s) education. It will take $50 off every boxed set, and it expires on 12/20/2015. Do you love to read? Do your kids love to read? How do you make reading fun for your children? I think this system looks very cool. I bet it could be especially helpful for homeschool! I love this rewards system to get preschoolers reading. I have always read to my kids and in turn they are really good readers. Love this option is there for new parents. This book club looks awesome! My twins would love it. They are obsessed with books. Even though my daughters are very young. they have lots of book and we read stories every night. I love our special, quiet time. My kids love to read. It is so important to get them interested in reading when they are young. Raising children who love to read begins before a child can even walk. Just having your child sit on your lap while you read to him/her is a great start which will follow them into preschool and beyond. this is perfect timing as i was looking for something just like this for my five year old. i wanted to get her a reading and book subscription as part of her christmas gifts. my kids have a huge library already, but i like to keep things fresh and get them some new books at least once a week. i’m so excited to have found this. my gal is really trying to hard to learn to read and this will help a bunch!